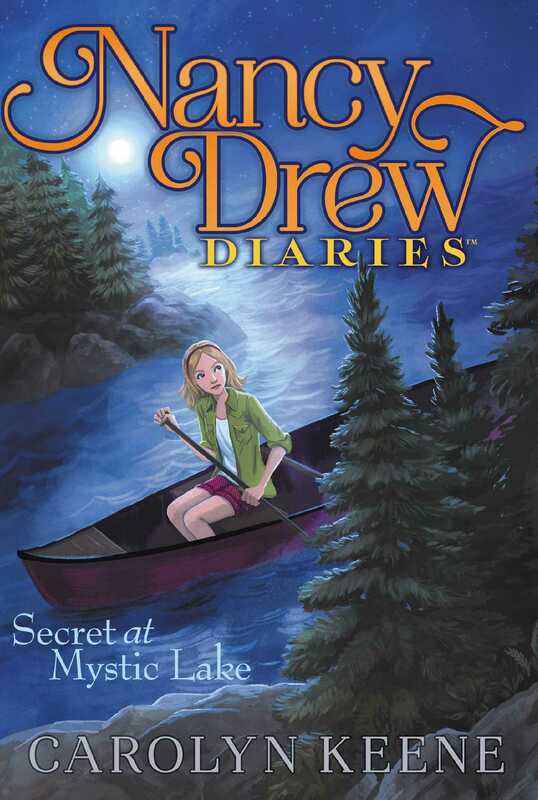 A few nights in nature take a nasty turn for Nancy and her friends in this sixth book of the Nancy Drew Diaries, a fresh approach to a classic series. To celebrate her birthday, George is taking Nancy and Bess on a three-day bike tour around the scenic Mystic Lake. They can’t wait to spend time exploring the gorgeous landscape by day and camping under the stars at night. What they didn’t count on was sabotage! First someone steals food and supplies from their packs. Then tour guide Caitlin vanishes overnight, and the entire group finds their tires slashed to bits. Now Nancy is cycling for clues instead of soaking up the scenery. Can Nancy track down the culprit before she and her friends are lost in the woods forever? “I CAN’T BELIEVE I’M DOING this,” my friend Bess Marvin muttered, poking morosely at her eggs. We were all eating breakfast at the quaint inn where our upcoming three-day bike tour around the scenic, sprawling Mystic Lake Park was about to start. George’s parents had bought the trip for all three of us as a birthday gift to George, and they’d come to drop us off so we wouldn’t have to leave our cars. Bess wasn’t exactly as thrilled about the trip as George and I were. In fact, she was distinctly unthrilled. George shook her head. “Because I’m not you?” she retorted. “Come on, Bess. This will be fun. I bet you’ll end up loving it.” Though they were related, Bess and George couldn’t be more different from each other. George was sharp, sensible, and outdoorsy; Bess was cheerful, fashionable, and decidedly not outdoorsy. “Like I’ve been loving all our practice rides?” Bess asked snarkily, then couldn’t help breaking into a smile. George and I both started laughing. The truth was that Bess had been a pretty good sport on the practice rides the three of us had taken around our hometown of River Heights. We’d started at ten miles and worked our way up to thirty-five, which was the length of the rides we’d be taking on the tour. I was no athlete, but I kind of liked the bike rides; it was exhilarating whooshing through the town, almost like you were flying. I’d been sore for days after the first couple of rides, but gradually I’d gotten stronger. After our last ride, I hadn’t had to take even one aspirin. “Ooh, look,” said George, pointing at a tall, honey-blond girl who’d just stepped into the dining room. She was wearing bike shorts and a slim tank top, and her hair was pulled back into a sleek low ponytail. Behind her came a boy about her age, also with honey-blond hair, but his was cut short and matched the stubble on his face and chin. He wore a pair of cargo shorts and a baggy T-shirt that read A LEGEND IN MY OWN TIME. “I think that’s Caitlin and Henry—they’re twins, and they’re leading the tour.” Our tour was run by a business called Adventures & Company that George said ran lots of these types of trips, but Caitlin and Henry had been featured online as the coleaders of our particular trek. Caitlin and Henry shook each of our hands. “Welcome,” said Caitlin. “I think we’re going to have a lot of fun.” She smiled, but I couldn’t help noticing that there was something tense behind her smile. Then again, maybe I was reading too much into it. I have a tendency to do that sometimes. See, my thing is solving mysteries. My friends love to tease me about it, but they’re always happy to join me in cracking a case. Together we’ve snagged more than our fair share of crooks in River Heights. If there was something odd in Caitlin’s expression, Mr. Fayne didn’t seem to notice. “I’m Russ Fayne, George’s dad,” he said. Again, Caitlin didn’t seem bothered in the least as she launched into a description of how she’d grown up doing long-distance biking trips with her parents, camped all over the country, was a varsity athlete in high school, and was planning to study environmental science at Yale in the fall. But Bess still looked puzzled, as though she was trying to do the math in her head. “How many AP courses did you take?” she asked. Caitlin was turning slightly pink. “Eight,” she replied quietly. Henry smiled as he said that, I noted, but Caitlin didn’t. She turned back to us, all business. As Mr. Fayne interrogated Caitlin and Henry some more, George reached over and touched my arm. “Let’s make sure we have all our gear together,” she suggested. “Sure,” I agreed, and got up from the table to follow her and Bess out to the foyer, where we’d placed our packs. We each had a large backpack containing a few extra clothes, changes of underwear, toiletries, aspirin—the bare essentials. Caitlin and Henry had provided a list of items we’d need for the trip, but they didn’t include too much. “Probably so we don’t get bogged down with stuff during the ride,” George had noted happily. We all also carried a big bottle of water, and George’s parents had gotten us some protein bars, “just in case.” (Meals were included in the tour, but the Faynes didn’t want us to get hungry.) The Faynes had also sprung for a super-fancy, superlight tent that the three of us would take turns carrying on the rides and share at night. It was separate from the packs, and George suggested that we draw straws to figure out who would take it first. I “won,” so I would carry it on the first leg of our trip, until lunch today. Zoe bent over laughing at her own joke, and Bess giggled too. We all looked up to see George’s parents approaching the doorway from the breakfast room, already getting misty-eyed. “It’s about time to get going,” Mr. Fayne said, walking over to George and putting an arm around her shoulders. George winced at the sound of her real name. Nobody ever used it except for her parents. But she quickly recovered and leaned in to give him a hug. “Oh, we are,” she assured him. George cleared her throat. “I think what Zoe means is . . . it’s fine,” she said, shooting Caitlin a comforting smile. Twenty minutes later I settled myself on my bike seat and pushed off, following behind Bess, George, and four others, including Zoe. The Faynes stood waving on the steps of the bed-and-breakfast. “Have fun!” Mrs. Fayne called. Bess turned around and shook her head as if to say, Like that’s possible. We all kept waving and calling our good-byes until we rounded a corner out of sight. We passed a low wall of pine trees and suddenly a gorgeous vista came into view: rolling hills surrounding a glimmering blue lake. Mystic Lake. Everyone oohed and aahed. Bess, who was already panting behind me, let out a little sigh. “I hope we experience lots of resting, too,” she muttered, too low for most of the group to hear. But Zoe, who was in the back of the pack with us, laughed that same crazy laugh. Bess glanced at Zoe with a surprised, wide-eyed stare that said something like, You just might be my soul mate. “Who’s your favorite?” she asked, tossing her long blond ponytail. I couldn’t help smiling—trust Bess to find a fellow fashionista and outdoors-hater, even in the least likely of places. But then I caught George’s eye as Bess pedaled ahead, making space for Zoe. By the time we stopped at a still green pond for lunch, we’d seen a family of deer, two groundhogs, a bald eagle, and something George swore was an elk but just looked like a big log to me. We’d also seen, as Henry had promised, tons more breathtaking scenery. Still, I could feel my muscles complaining as I dragged myself off the bike and walked the short distance from where we’d left our gear by the side of the road to the picnic tables a few yards through the trees, by the pond. It’s going to be an aspirin night! I thought. A short, gray-haired man beside her, one of our fellow bikers, looked out at the same vista and nodded sagely. “Communing with nature makes us feel more alive,” he said solemnly. George looked over at him and smiled. “I don’t know if we’ve met. I’m George,” she said. “And I’m Nancy,” I added. Dagger was the only person on the tour we hadn’t yet met. The group was made up of Bess, George, myself, Henry, Caitlin, Zoe, and Dagger. So far Dagger, Caitlin, and Henry seemed like serious bikers, while George, Bess, Zoe, and I pulled up the rear. Caitlin was very patient with us, though. She pointed out that we were all there to see the sights, first and foremost—how fast we saw them was unimportant. We all settled down by the pond while Caitlin fished around in a cooler and brought out sandwiches and fruit. Henry walked up to the table and sat down heavily. I noticed he made no move to help his sister, who arranged eight sandwiches on the table, all in color-coded plastic bags. Bess seemed restless; she kept glancing back at the road with an uncomfortable expression on her face. “Something wrong, cuz?” George asked, taking a big bite of her ham and cheese sandwich. George glanced at me and rolled her eyes. We’re all city girls, she mouthed. Bess shrugged. “Okay—if you say so.” She sat down and we all dug in to our sandwiches, making polite conversation about where we were from, what we did, and what had brought us to the tour. Dagger was a bookkeeper from Chicago who wanted to feel closer to nature, and offered to lead us all in meditation just after dawn the next morning. Henry and Caitlin were recent high school graduates from the nearby town of Taylorville. Zoe was a college student who was spending the summer with her parents in nearby Cedar Village. Caitlin raised an eyebrow. “Oh, great,” she said. If she was being sarcastic, Zoe didn’t pick up on it. Everyone stood, and when I struggled to get to my feet, I fully realized how stiff my muscles had gotten during our short rest—and how sore I would be that night. Oh well. I was really enjoying the ride and the scenery so far. Caitlin led the way through the trees back to our bikes and gear, but stopped short when she got to the road. “Oh . . . oh no,” she murmured. Caitlin was staring at the ground. “That’s strange,” she said, turning to look at Henry with a confused expression. Henry looked where Caitlin was staring, and his face paled. “Uh—it looks like . . . ?” he said, glancing at his sister. Bess held up a hand, like she was in class. “Can someone please tell me what’s wrong?” she asked. Caitlin shook her head, then pointed at our packs—where, I noticed suddenly, there seemed to be slightly less gear than there was before.